The Waterblogger: The Cornish Pasty: Just a Meat and Potatoe Pie? Or An Underground Miner's Savory Savior? The Cornish Pasty: Just a Meat and Potatoe Pie? Or An Underground Miner's Savory Savior? When trying to teach kids about subjects that might seem complicated, like science, it always helps to use anecdotes that relate to things they can easily understand. In working with the students of the Upper Clark Fork basin, helping them to learn the health affects of some of the toxic substances found in mining wastes, like arsenic, lead and mercury, I’ve made it a point to use Butte’s hallmark entrée, the pasty. Of course, we all like to think of the pasty being as Butte as Butte can be. However, just like the mining that made our town famous, the pasty too hails from some place else. When mining began to peter out in Cornwall in the late 1800s, the “Cousin Jacks,” as they were known, emigrated to the mining meccas abroad, like Michigan’s Copper Country and of course, Butte, to carry on their multigenerational skills. They also brought with them the pasty. So how do you explain the human health affects from heavy metals and arsenic through a hand-held meat and potato pie? It turns out that the Cousin Jacks didn’t just eat pasties because they tasted great and were more filling than any lunch you could take underground. Talk to anyone who’s worked below or take a peak at a historic photo of the working folk from Butte’s heyday: Underground mining is a dirty business, perhaps the dirtiest of them all. A shift underground would cover you from head to toe and then some in the mine’s dirt, dust, muck and mire. And although they were mining copper, silver, tin, whatever the moneymaker happened to be in the rock, there came with it all the other geologic tagalongs not so desirable, like arsenic, lead, cadmium, mercury, toxins that will eventually wreak havoc on a man’s health. The two major pathways for these poisons to make it into our bodies is either breathing it in (inhalation) or eating it (consumption). Once a man went underground to work, there wasn’t any coming back up to the surface until the end of his day, unless he came up dead or maimed. In the days before respirators and dust masks, there wasn’t much a miner could do to keep from inhaling the metals-laden dusts, save for holding his breath – an impossibility over an entire shift. And there weren’t any faucets or methods of washing away the grime from your face or hands before lunchtime. Prior to the pasty, miners in Cornwall probably ingested an equal amount of poison for every bite of nourishment he ate at lunch. Chronic diseases from arsenic, lead, mercury and other heavy metals poisoning like cancer, ulcers and Mad Hatter’s disease were traced to the ingestion of these ubiquitous mining toxins early on, but that didn’t mean a miner was going to stop eating underground. Hats off to the Wives of Cornwall for fashioning a tasty solution to the problem. The traditional Cornish pasty had a pinched crust much thicker than the ones on the pasties we eat today (see top photo). The large, thick crust on the side of the original pasties was put on to serve as a handle, something the miners could hold on to with their filthy hands, while they ate the rest of the pie untouched and therefore, untainted with whatever might be clinging to his fingers. Another note of difference between today’s pasty and the original is that the first pasties usually had rutabagas or turnips in them along with the standard meat and potatoes, as well as a compartment that held a fruit filling at one end to serve as “dessert.” When the miners were finished eating the filling, all they had to do was chuck the crusty handle and go back to work. It was also said that the throwing of the crust into the mines was a token of bribery or maybe even appreciation to the underground spirits or “knockers,” blamed by the workers for causing rocks to fall on them or other dangerous happenings often resulting in death. 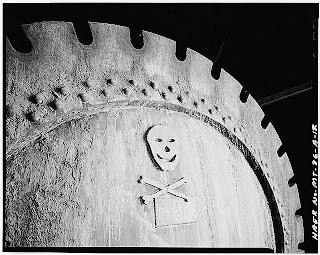 There were well over 2,000 men who died in Butte’s underground mines over their operation; this number does not include those who perished from contamination-related disease or other ailments after they came back to the surface. Only the knockers know how many pasty crusts were left behind and eaten. So the next time you don’t have the time or facilities to wash your dirty hands before eating lunch, grab on to a pasty and don’t forget to leave the crust behind. Your body and tastebuds will thank you...and so will the knockers.